Watch The Beatles Record "Hey Bulldog" in 1968. Beatles Radio: The Beatles, Solos, Covers, Birthdays, News The Fab 4 and More! Even though the Beatles hired a film crew to document the 1969 recording sessions for what would become Let It Be, it's a bit uncommon to see studio footage of the band at work before that time. Which is why the "Hey Bulldog" music video is so unique. The February 1968 footage seen in the clip was originally utilized in the "Lady Madonna" promotional video, until someone (perhaps a talented lip reader) noticed the band was actually recording "Hey Bulldog" (The band recorded both songs during the same sessions). The footage was later re-cut to fit "Hey Bulldog," one of many standouts from the Yellow Submarine soundtrack album. If you're into the Beatles' gear, you'll appreciate this clip. 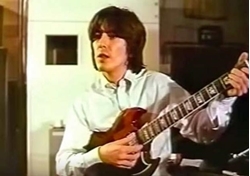 While John Lennon's ubiquitous Epiphone Casino makes an appearance or two (as does Paul McCartney's Rickenbacker 4001S), the real star is George Harrison's cherry-finish Gibson SG, which you can see in the photo above. And then there's that stinging guitar solo. Its authorship has been up to debate over the years—some say it recalls McCartney’s performance on “Taxman”—but engineer Geoff Emerick says it was definitely played by Harrison.